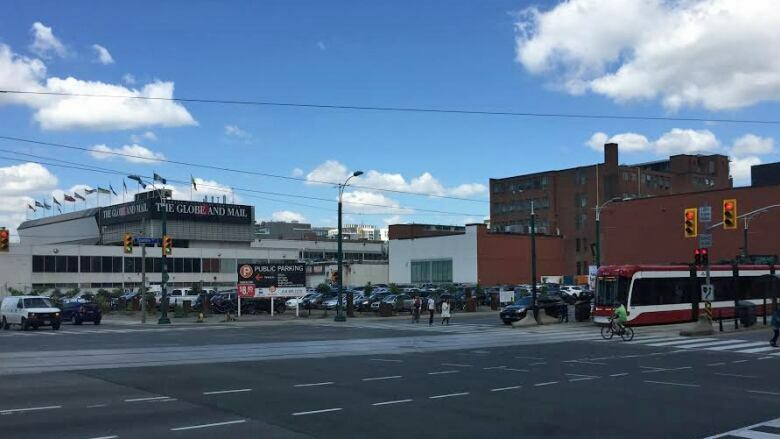 A group of real estate companies have reached a deal for redeveloping 7.67 acres of land on the northwest corner of Front Street West and Spadina Avenue. A group of real estate companies have reached a deal for redeveloping a parcel of land in downtown Toronto, just north of the railway corridor. Rights to the residential component of the land redevelopment are being sold for $180 million to Tridel Builders Inc. and a limited partnership managed by Woodbourne Canada Partners. The land slated for redevelopment is currently being used as a parking lot, but half of it will become rental apartments and residential condominiums in the future. (Nicole Dawe)The land parcel was assembled in 2012 and 2013 by a joint venture known as The Well, which is jointly owned by RioCan REIT (TSX:REI.UN), Allied Properties REIT (TSX:AP.UN) and Diamondcorp. The group says rental apartments and residential condominiums will occupy nearly half of the the parcel's approved density. The Well joint venture expects current tenants on the land to leave by the end of this year and development to begin in early 2017.